First Mac & Cheese Night of 2015! 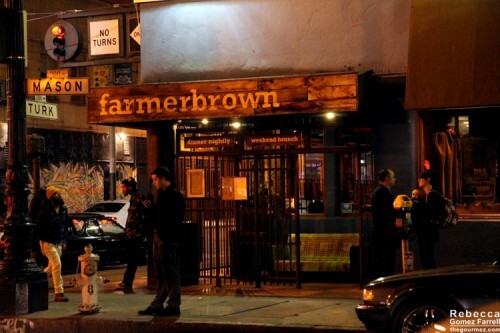 This outing took us to Farmerbrown, just about a block from the Powell St. BART stop in the heart of downtown San Francisco. 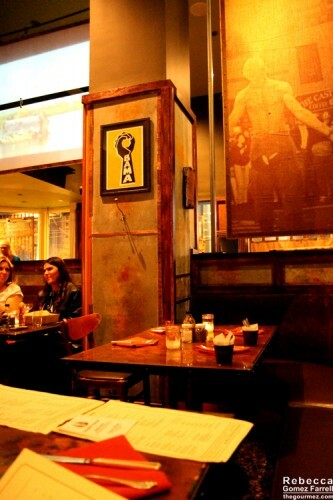 Our original location was meant to be Grub in the Mission District, but it turns out Grub must have closed sometime in December! That makes two restaurants on the 7×7 list that no longer exist and two more left to go before my mission is complete. Farmerbrown is a Southern restaurant, perhaps one that could be called Soul Food, but I don’t think there’s enough crustacean or spice on the menu to qualify as that. I’ll go ahead and give you our overall impression of the restaurant: good, solid food that would have been great if, oh, $5-$10 cheaper per entrée. Yes, this is San Francisco, but I don’t want to live in a world where a pulled pork sandwich costs $17.50. It’s just not right. 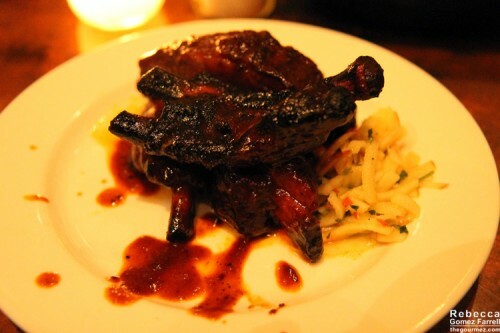 –and the appetizer portion of BBQ baby back ribs with an apple-jalapeno coleslaw for our entrees. I can personally testify to the ribs being tasty with a sweet & spicy sauce, though they were perhaps too charred in spots. My coleslaw was unique for being nearly all apples and quite flavorful. The catfish plate drew high praise from Friend #1, especially for the challenge presented in consuming all of those well-cooked vegetables. Friends #2 and #3 split the fried chicken and enjoyed it, though it could not compare to the double-dipped versions they’ve had in the past—what could, really? 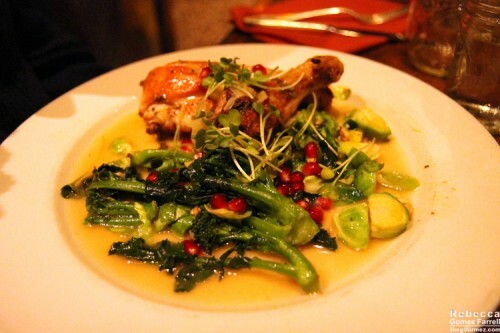 The Husband thought his oven-roasted chicken was good, and it was certainly the healthiest option among the bunch. We also split a few sides for the table. 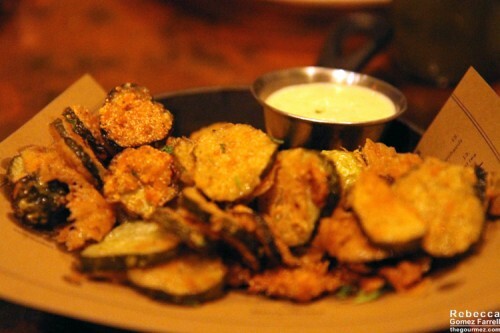 Those fried pickle chips were warm and squishy with a refreshing dip, but the batter could have been a lot crunchier and firmer. 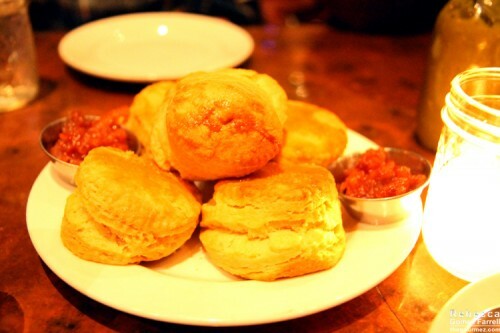 That’s the double portion of the angel biscuits, which were inconsistent, ranging from fluffy and delectable to misshapen and undercooked. 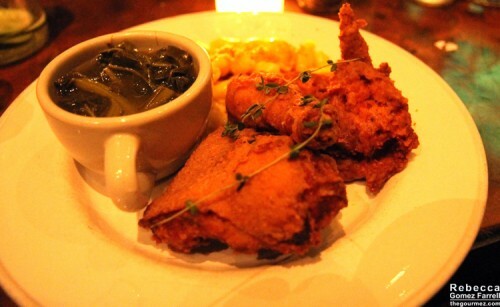 My biscuit was much denser than I’d expect from a restaurant claiming Southern roots. However, I appreciated the inventive spiced jam that came with it. Also a plus was the green chile hot sauce at every table that I ended up pouring liberally over my ribs to make them swim in spicy sauces. 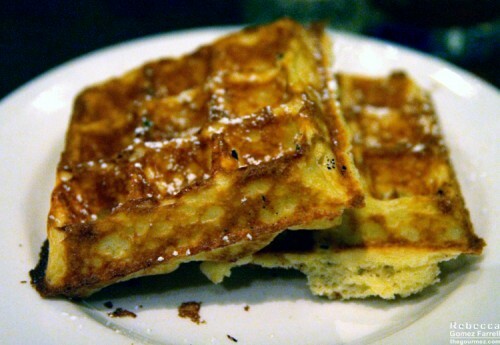 The crisped outer shell of the side of waffles reminded me strongly of a liege waffle, and Friend #3, who actually ate them, agreed with that correlation. And of course, there was the mac & cheese. 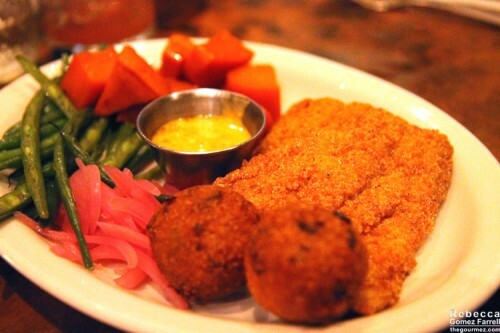 We had it both as a starter and as a side dish with the fried chicken. Price: $7, which I do think is reasonable for the portion. Four of us split it to assuage our hunger before the entrees. Cheese: Tillamook Cheddar. It’s a strong flavor, but not enough to make the dish pop. Creamy vs. Stringy: Creamy all the way. But the flour wasn’t smoothly incorporated into the béchamel base for the cheese sauce, which Friend #2 didn’t like. Being as I enjoy a bit of grit in my food, I didn’t mind. Noodles: Medium shells. They were cooked slightly past al dente. Shells’ tendency to stick their flaps together doesn’t make them an ideal mac & cheese delivery vessel. Breadcrumbs: Very fine. They added little to the dish except extra grit to put off those who didn’t want grit in the first place. Verdict: Much like most of Farmerbrown’s food, the mac & cheese was good, but not great. I’d put it on par with what most people could easily make homestyle in their own ovens. It was a very standard dish. Comfort food without any zing to remember it by. We did, of course, also try out Farmerbrown’s cocktail list. Friend #1’s Old-Soul Fashioned was on the sweet side, but she enjoyed it. 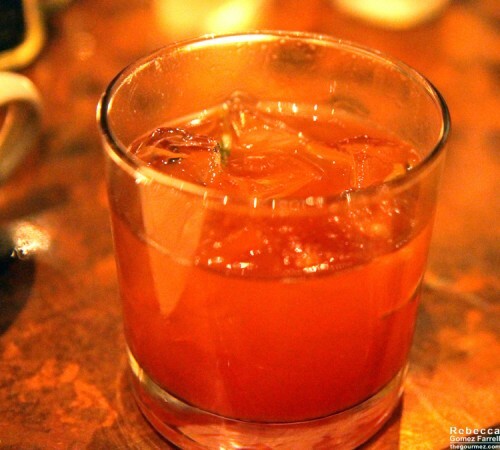 It’s made with Four Roses bourbon, brown sugar, sage, raspberry jam, and house-made ginger nectar. Hard not to imagine that that would end up sweet! I had their bourbon milk punch, which differs from many milk punches in that it was served warm. Well, it was supposed to be served warm. Mine was maybe a smidge above room temperature. Maybe. 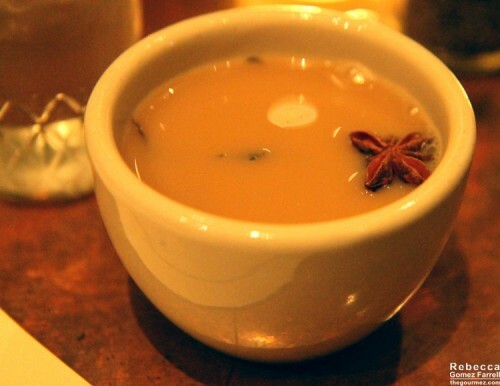 But it was an excellent balance of bourbon with milk steeped with cardamom, honey, allspice, and other spices. I’d recommend it. 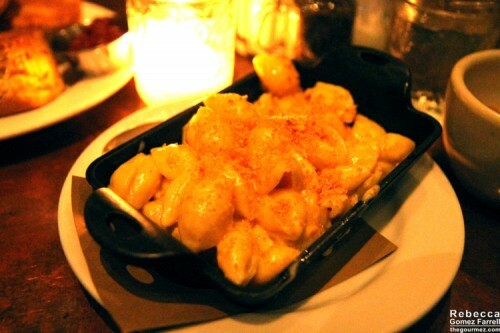 Next month will be Fat Angel’s drunken goat version of mac & cheese! I can’t wait.